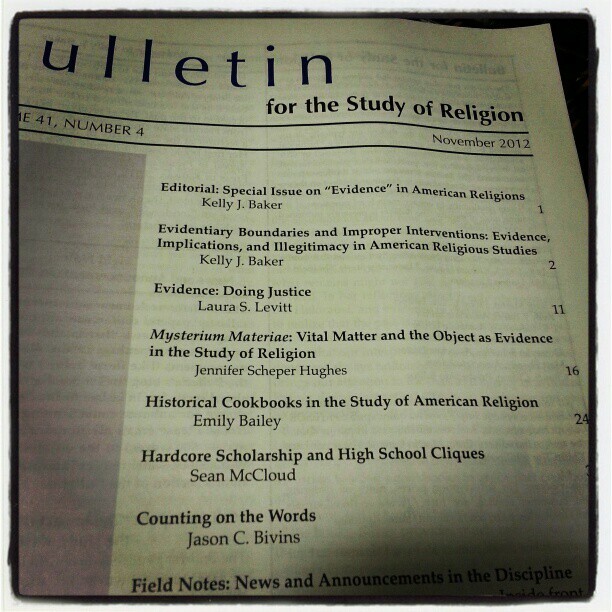 The following is the editorial introduction to the most recent issue of the Bulletin for the Study of Religion (41.4, November 2012), written by our new co-editor, Kelly Baker. We offer this here in order to give readers of the blog a sense of what is coming out in the Bulletin. For the Table of Contents of this issue, see our earlier blog entry. In the study of religions in North America, interdisciplinary scholarship ranges from religious studies to history to sociology to political science to American studies to cultural studies and many more. Under the banner of studying religion and religious people in America, scholars go to the archives, engage in field work, examine artifacts and images, conduct surveys and polls, watch films and television, and read primary sources and secondary sources. These approaches inform how we do scholarship, what counts as religion or religious, and what emerges as the “evidence” of belief, practice, devotion and, importantly, religiosity. What, indeed, is the “evidence” of religion? Scholars cannot easily interrogate the ephemeral, the spiritual, or the intangible; rather, we must construct the porous category of religion via the remnants we find left behind. Our discussions of religion emerge out of what religious people say, do, create, build, hear, embody, negotiate, and contradict. These fragments of religious experience become our venues to recreate the stories of religion in North America, both local and grand, as well as theorize about religion as a category. Our evidence appears from the lives of practitioners both past and present. We use diaries, journals, newspapers, testimonies, theologies, or words and texts. We use the objects of religion from altars to crucifixes to t-shirts to bumper stickers to shrines to jewelry to architecture and built environment as the “stuff” of religion. We encounter bodies in prayer, in mourning, in ecstasy, in flagellation, in fasting, in dance, in motion, but also in silence, in stillness, and in containment. Evidence becomes beliefs, theologies, artifacts, and embodiment. While scholars of North American religions are adept at recording the how and why of religious and not-so-religious Americans, the question of evidence is a pressing one. It is now time to interrogate what our “evidence” of religion is. Archives, fieldwork, objects, pop culture, literature, bodies are all mechanisms of evidence. Each presents particular benefits and consequences. The question of how we claim, codify, and deploy this ranging evidence becomes paramount. This special issue, then, seeks to address the issue of “evidence” and the relationship of our own “evidence” to the type of scholarship we do. All but one of the articles began as papers for a session of the North American Association for the Study of Religion that I organized in 2011. The panel included the following prompts: What is evidence? What kinds of evidence do we use? How does it color our approaches to narrating religions in North America? Relying upon our own case studies, we sought to interrogate our own approaches to evidence as well as to discuss how certain types of evidence yield different approaches to scholarship. In this issue, we continue our initial conversations but carry them further with responses from Jason Bivins and Sean McCloud. I start off the issue with questions and concerns about legitimate (or illegitimate) evidence and the scholarly boundaries of my particular sub-discipline of American religious history. While reflecting on my work on the Klan and the assumptions about how and why we do scholarship, I emphasize that our discipline has much to lose in enforcing boundaries on what counts as the legitimate evidence of religion. Laura Levitt poetically reminds us all that our evidence is at best partial and that what remains might not give us the stories we want or need. In her reflections about family photographs, the Holocaust, and evidence of crime, Levitt urges us to realize that the past is much more complicated than our collected artifacts of it. Our task as scholars is to realize that our interpretations and analyses of our evidence are always unfinished. Jennifer Scheper Hughes brings our attention to the lives and agency of artifacts. Rather than interpreting objects as inanimate and easily interpreted, Hughes intervenes by suggesting that scholars should pay attention to the agency of objects because practitioners comprehend objects in this way. Emily Bailey provides a close and careful analysis of Victorian women’s cookbooks to argue that cookbooks and recipes are valid evidence for academic study. By examining recipes, advertisements, and the physicality of the books, Bailey provides much-needed insight into the lived experience of domestic life for Victorian Protestant women as well as the contested ideals of proper womanhood. Together these essays suggest that how we define and comprehend evidence is one of our most important (and overlooked) roles as scholars.
. Thanks to all those involved in the NAASR panel: Laura Levitt, Lauren Winner, Jennifer Scheper Hughes, and Thomas Tweed. Emily Bailey’s paper is an excellent addition to the issue as are Sean and Jason’s responses. Phil Tite, Craig Martin, Chris Baker, Lucia Hulsether, Matt Cressler, Chip Callahan, Paul Harvey, and my students in REST 351 were all wonderful conversation partners. This entry was posted in Academy, Announcements, Editorial, Kelly J. Baker, Religion and Society, Religion and Theory, Theory and Method, Theory in the Real World and tagged american religion, American Religious History, Bulletin for the Study of Religion, Religion, religious studies. Bookmark the permalink. “Evidence” and what is determined to fit that category (and why) is a pivotal category for intellectual exploration. This editorial bodes well for the development of lines of inquiry in the study of religion that have proven fruitful elsewhere; similarly, studies done by scholars of religion may be read and, one hopes, raise the level of the default position in many studies of culture that :”religion” (by which is usually meant Christianity) is stupid, and bad, and therefore unworthy of study. One observation: “religion in North America” is not the same as “religion in America” or “American religion.” The latter are just not inclusive categories (and are even less so than the formerly ubiquitous “Man.”). I hope this categorization will be examined and corrected – or at the very least, debated.